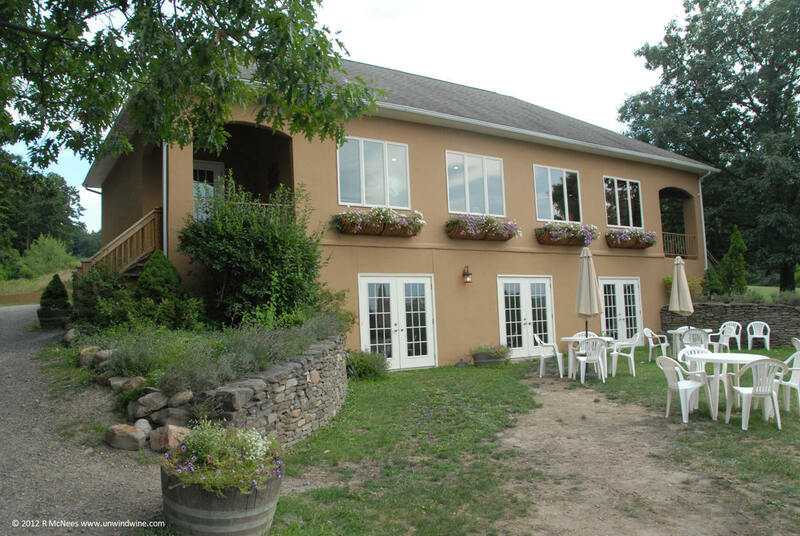 We went out of our way and made a point to stop at Ravines Wine Cellars on the south east shore of Keuka Lake in Central New York's Finger Lakes wine region during our 2012 Finger Lakes Wine Experience. It was a priority visit for us since its one of the few Finger Lake producers and wines available in Chicagoland. Ravines Wine Cellars (left) is run by the husband wife team, Morten, viticulturalist and winemaker & Lisa Hallgren, self proclaimed 'foodie'. Morten was raised in Provence region of Southern France where the Hallgren family owned Domaine de Castel Roubine, a 270 acre estate with 170 acres of vineyards and where he spent years in the vineyards learning viticulture - tending to the vines. After earning an advanced degree in Enology and Viticulture at the renowned winemaking school, Ecole Nationale Supérieure d’Agronomie in Montpellier, he spent time working at the classic Bordeaux producer, Chateau Cos d’Estournel, under the legendary Bruno Pratts. He came to America working for a French negociant, then at the Biltmore Estate in North Carolina before he was recruited by Willy Frank to be chief winemaker for Dr. Konstantin Frank’s Vinifera Wine Cellars on the opposite side of Keuka Lake, the early pioneer and most established brand, who is credited with establishing serious wine production in the Finger Lakes region. 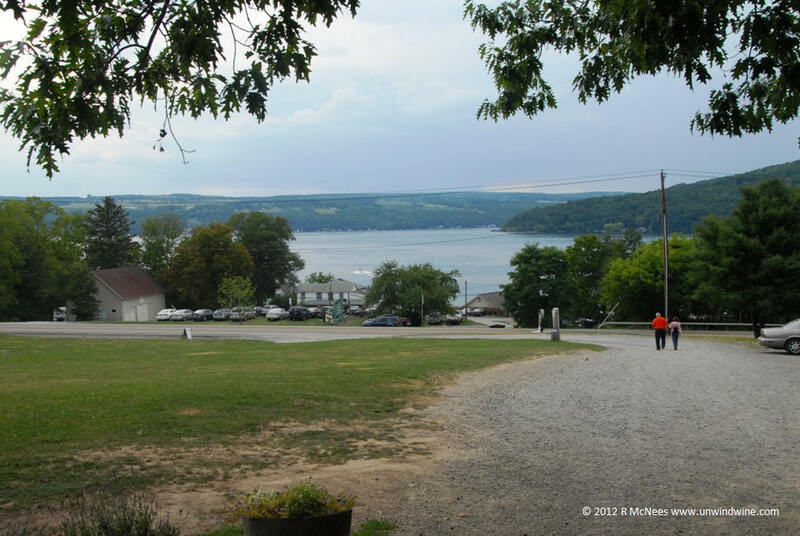 After six years at Franks, the Hallgrens purchased the 17 acre Ravines estate in 2000, named for the ravines carved out of the glacier-sculpted hillside on the Eastern slope overlooking Keuka lake (left). 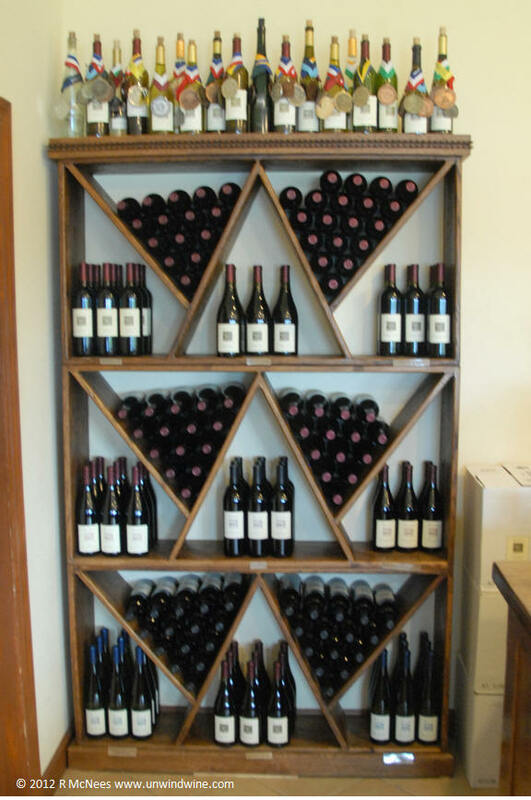 They source grapes from three vineyards located on the East side of Seneca Lake. While they offer a broad line of red and white wines, from many diverse varietals (shown left), like so many Finger Lakes producers, I feel too many Finger Lakes producers are over-extended with too many varietals and labels and should stick with what they do best, that which is most suited to their terroir - climate, soil, exposure, degree days, sun days, length of growing season, rainfall, and so on. Old World producers, after centuries of experimentation and refinements have perfected matching the most suitable wine grape varietals to their unique terroir or sense of place at their locale. Certainly, this is the case in France, Portugal, and Germany - (I don't know what to make of Italy with their 500+ grape varietals - perhaps this is a reason we don't collect and specialize in Italian wines). Several Finger Lakes producers offered more than two dozen different wines. Several times, we walked into a Finger Lakes winery where they were serving a dozen plus different wines and I asked for simply their flagship signature wine, and they didn't have one, or didn't know which one to feature. For most of the producer's we visited, they offered almost too broad a selection of as many as a dozen or more different wines, without a highlight or showcase feature label. Ravines seemed to be less guilty of this excess than most of the others. Even then, Ravines produce Merlot, Pinot Noir, and Cabernet Franc and a properly licensed Meritage, as well as several white wines including Gewurtraminer and Chardonnay besides the Riesling. From all the wines, we tasted during the several days traversing the area, Riesling, Gewurztraminer, and perhaps Cabernet Franc for the reds, seemed to be the varietal (s) best suited to the cooler more moderate climate of the region. 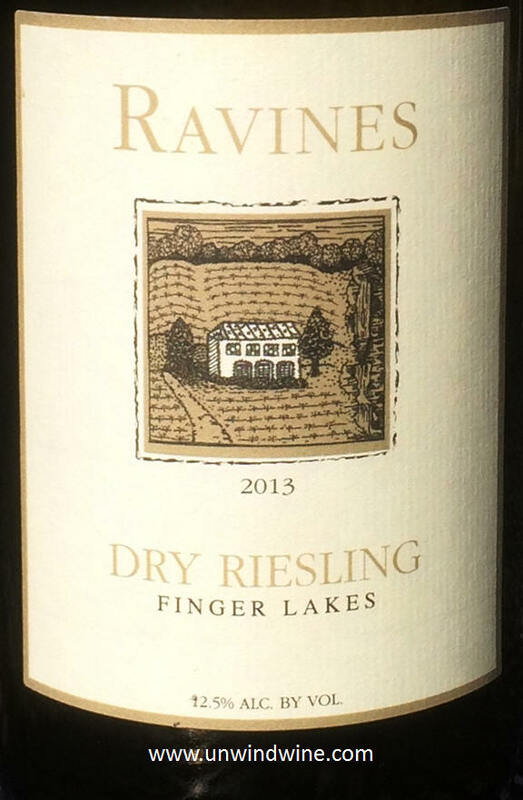 We continue to buy and enjoy Ravines Dry Riesling with each new vintage release. Tonight, for snacking while watching NCAA March Madness, with crackers and chips, Linda prepared a creative, tasty artichoke dip with chopped spinach, jalapeno, parmigiana, Greek yogurt and garlic seasoned salt, when went very nicely with this tangy Dry Riesling. While not elegant or sophisticated, this is a pleasant easy drinking every day white that offers reasonable QPR - quality price ration - at under $14. I've written a great deal in this blog about wine marketing and branding. I applaud Ravine in this area with their tasteful, creative and decorative label (label) depicting the chateau (pictured top) and terrain of the estate. Straw colored, medium light bodied, full forward flavors of grapefruit and tones of lemon and mineral with a subtle note of garden hose rubber on the mid-palate through the tart tangy focused acidity on the citrus finish.